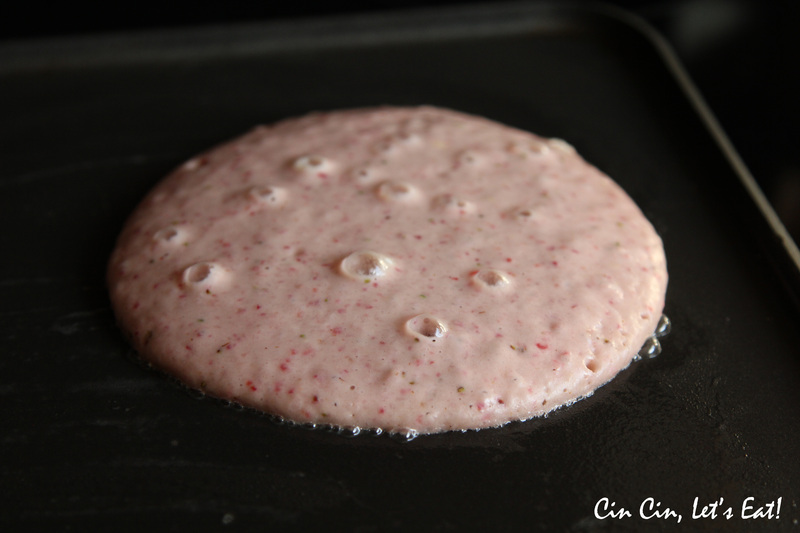 Strawberry Pancakes [recipe] – Cin Cin, Let's Eat! Strawberries are everywhere right now! I can’t help but to buy a whole crate of these sweet and succulent berries every weekend at the farmers’ market. 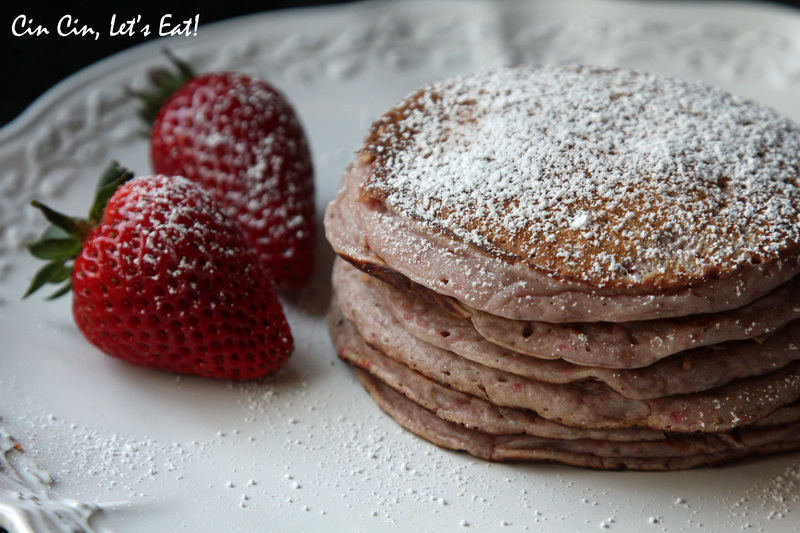 Last night I was craving pancakes for dinner, so I added some strawberry puree to the batter and had strawberry pancakes for dinner! Mix dry ingredients together in a bowl: flour, baking powder, sugar, and salt. Lightly beat the egg in a separate bowl. Add in 1/2 cup of milk, strawberry puree, then melted butter. Mix well. Add the wet ingredients to the dry, whisk to get all the lumps out. Add more milk if the batter is too dry and lumpy. Heat the griddle or skillet over medium heat, grease with a dab of butter then cook away. I like to use 1/4 cup of batter for each pancake, or you can use two scoops of muffin/ice cream scoop per pancake. Serve with powder sugar and/or honey. Next time I’m adding in some bittersweet chocolate chips. 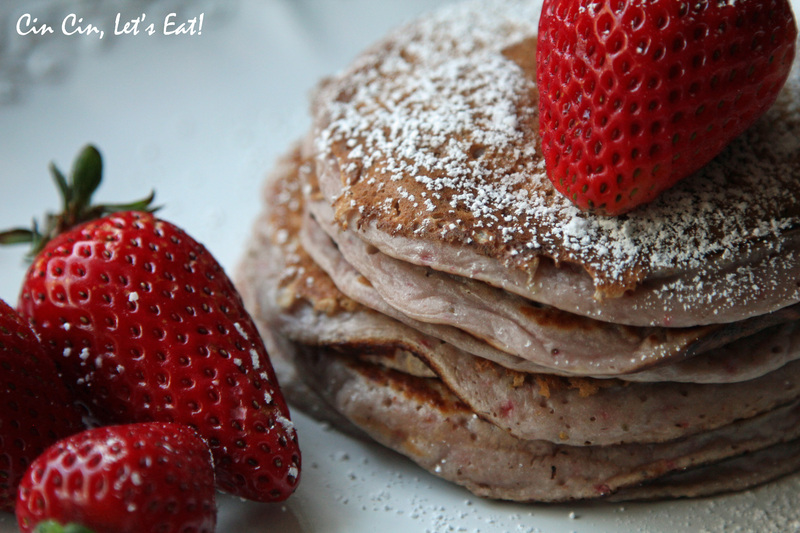 My wife Hana and I are pancake efficienados and LOVE the recipes you provide. Thanks so much!